This week went by pretty slowly, but of course the weekend flew by. Don't you hate how that goes? 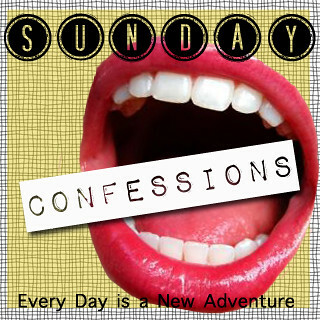 Anyway, it's Sunday, and you all know what that means - time for confessions! Grab a button and link on up! 1. I'm a horrible secret keeper. It's really hard for me to keep secrets, especially if they're happy ones. I always want to shout them from the rooftops. 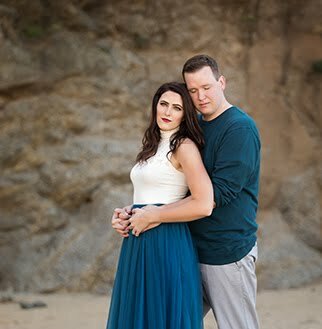 So... if you have a happy secret, don't trust me with it unless you want at least my husband to know. I have to tell at least one person the good stuff! 2. I didn't have any time to read this week, and that makes me super sad! Lately I've had this pattern - one week I'll read like, five books, and then the next week I don't have any time to even read one! It's kind of ridiculous. 3. 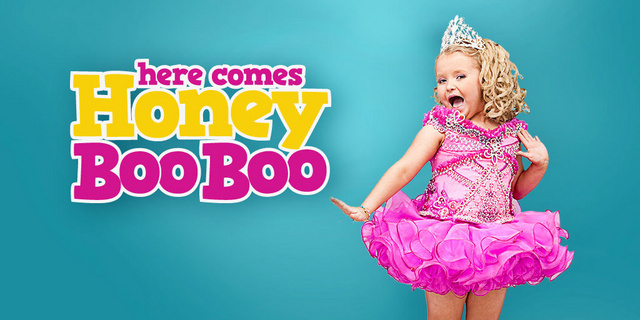 I just saw a preview for "Here Comes Honey Boo Boo," and I am considering wasting my life away by watching it. Yeah... how sad is that? I don't really have much more to say on this note. 4. I did 7 loads of laundry yesterday. This is a confession because I had 7 loads of laundry to do - that's like, 3 weeks worth. Yeah, I'm awesome. 5. I got the First book in the Game of Thrones series for my Kindle. I'm so stoked to read it. I just have to find a little bit of time to do it. Speaking of books!! We are going to start our book club in October with a young adult fiction novel. We are taking suggestions from you all for the next week. Once we have suggestions, we will narrow it down to three books and hold a vote in the last week of September. Leave suggestions in the form below! Also - have you entered this giveaway yet?? $50 of free money, yo! So.... link up your confessions!! I'm so glad I don't have cable anymore because I'd probably be addicted to that Here Comes Honey Boo Boo show... I don't know what it is about pageant shows but I find myself one part horrified and one part obsessed. Oh Honey Boo Boo...I have a really terrible feeling that is going to be as bad (and popular) as Jersey Shore. I avoid these things but when they come on it's like a train wreck that I can't turn away from! 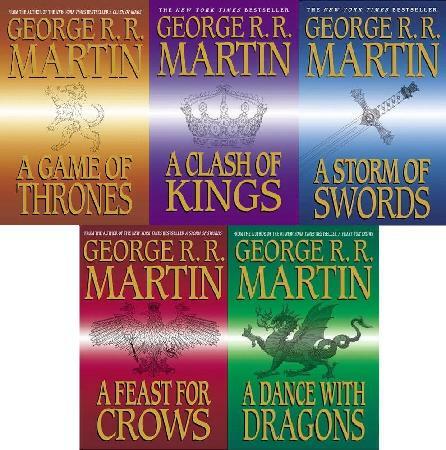 I also got GOT but need to start reading them, when I find time! What's a Honey Boo? I have been in the laundrey situation before. I'm guilty of leaving mine draped around my flat to dry and then using it like a giant wardrobe. I can be so lazy sometimes. I confess that I have stockpiled underwear until I have literally a 2 month supply. Just so I won't have to do laundry as much. I'm the same way when it comes to reading, it seems to be either constant or not at all unfortunately. It's hard to fit it into day-to-day life sometimes! Omg!! Can't wait to hear what u think about game of thrones!! So good, but seriously depressing! & I think its the law that you're allowed to spill secrets to your significant other....lol I'm definitely guilty!! I read the first game of thrones book. I need to read more. Do you watch the series? It was hard for me to keep track of the characters (there were so many) until I read the book. Have a great Sunday! My mom always told me that the best secrets are the ones that you can share with some people, they just have to be a secret from certain people, and I wholeheartedly agree! Thus, I don't think there's anything wrong with being bad at keeping secrets. I've yet to read or watch Game of Thrones. I guess that should be next on my list too! I'm a really bad secret keeper too... I hate that! I am a horrible secret keeper too & everyone knows it! I'm stopping by to link up, I hope you have a great weekend! I don't think I could watch Honey Boo Boo. Mainly because I think I'd get sucked into the craziness. Haven't read GoT and probably wont. From what my husband has told me when he read it, I would just end up hating it halfway through. But hopefully you like it. I know a bunch of people who love it. I also will totally participate in the book club because I LOVE YOUNG ADULT BOOKS OMG. Hope you dont mind, but I recced a few books that I feel dont get much love in the general public but are really really good anyway. Haha... I did 6 loads of laundry yesterday... you aren't as bad off as you think! And I heard the Game of Thrones is an AWESOME series. I can't wait to read them AND watch the shows! Yay for starting to read game of thrones. Warning: It can get heavy. And dark. But for the first three books I was soooo hooked! I'm on the last book right now and I've been reading it since...um, May. I've stopped and read other books in between because GoT can be SO dense and packed full of information, I can only read it when I'm not stressed out in the least bit...which only happens about once a week! you don't wanna know the weight of laundry piles i did before i went on work travel last week. I kept seeing people tweet about Honey Boo Boo, but new it had to be some kind of crazy tomfoolery and couldn't bring myself to look it up. What will they think of next? I just finished reading A Clash of Kings. I had to take a break b/c while they are good books, I think they're a little hard to read due to the language. I fill in my own names since I can't pronounce theirs. lol It has taken me a month and a half to read the first two and I normally go through one or two books a week. Honey Boo Boo just makes me angry. Like, my stomach got slightly upset just seeing the ad. I could go on a rampage about anything Toddlers and Tiaras related. Ahh I love reading, but I can never go through that many books in a week! Let me know how the game of thrones series is, I'm debating on reading it. I remember watching a youtube video with Honey Boo Boo. It was horrifying. My cousin came out to me as a lesbian last week. I'm the first person in our entire extended family that she has told. She attends BYU and she is terrified. The end. 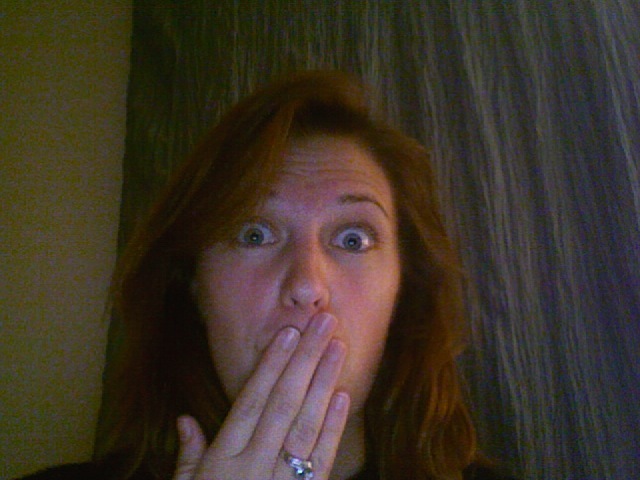 If it's a surprise I have the hardest time keeping it, but most of the time secrets are locked down! Thankfully! I think good news needs to be share but then again people aren't eager to tell me any secrets. i think i have to check out honey boo boo myself... she lives close to where i went to college... but don't judge georgians by anything you see on that show, mmkay? Trust me, Honey Boo Boo is worth the time to watch. It's both appalling, hilarious and generally good TV. I mean at the end of the day, the family is getting paid so I feel less bad laughing when I know that. Don't do it...(Honey boo boo) don't do it!!!! How is reading on a kindle? It seems so convienient when you want to start reading a new book. Guess what? This is exactly what large companies are paying for. They need to know what their customer needs and wants. So big companies pay $1,000,000's of dollars each month to the average person. In return, the average person, like myself, participates in surveys and gives them their opinion.